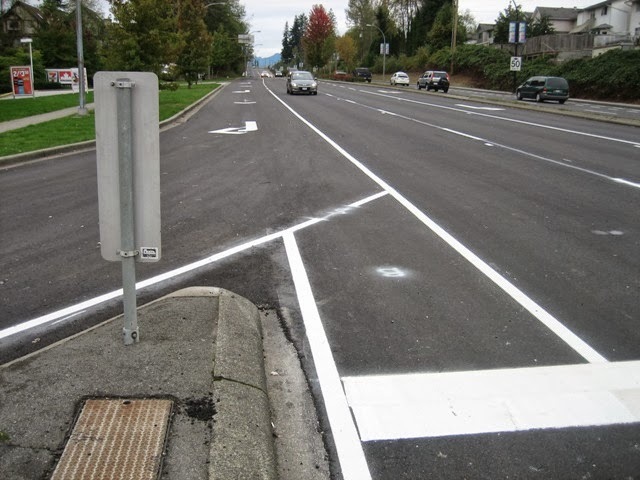 Maple Ridge/Pitt Meadows Cyclist: Lougheed repaving/restriping between Kanaka Way and 116th Ave.
Lougheed repaving/restriping between Kanaka Way and 116th Ave. 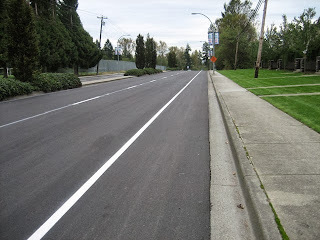 The District has just finished repaving and restriping the section of Lougheed between Kanaka Way and 116th Ave. (Telosky Hill, by Thomas Haney Secondary School) this week. We had asked the Engineering Department to make the car lanes narrower and the shoulders wider, especially on the north side, where previously closer to 116th Ave. the shoulder pretty much disappeared. It's looking pretty good. The car lanes could have been made narrower (I don't think cars are speeding any less than before), but it certainly is a big improvement now that we have official bike lanes (no they're actually shoulders, see update below). The only thing that is still missing is the bike symbols, which will be where the "B" markings are located. I'm - quite selfishly - quite pleased with this, since this is a route I take almost every day. Lougheed westbound at Kanaka Way: this is definitely an improvement. Previously the shoulder didn't start until the end of the on-ramp. Westbound, approaching the intersection at 116th Ave. Also much better! There was as good as no shoulder until now. Eastbound at 116th. The shoulder is pretty much the same as before, but nice smooth pavement makes for a more comfortable ride. The annoying ridge that was just about in the middle of the shoulder is gone. 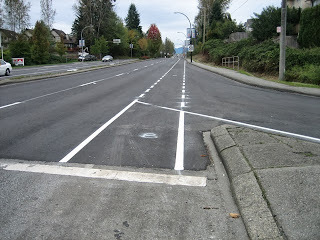 End of bike lane eastbound at Kanaka Way. 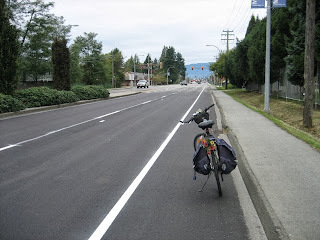 UPDATE March 10, 2014: I was actually mistaken that these are bike lanes. They're actually supposed to be shoulders. I noticed that on a recent map. I think the contractor probably was mistaken too, since only a few bike symbols appeared and then he never finished it. They might as well have made them into bike lanes.